Superannuation proves to be a very tax-efficient way to save money for retirement. There are huge tax advantages involved especially when you first pay money into super, with enough money in your super fund. Also, there is some tax on super contributions. Australians have embraced the concept of superannuation, figures(2015) indicating assets held in superannuation funds hovering around a whopping $2 trillion! One should make sure the Tax File Number provided for your super fund, or you might pay more tax than required. For most income-earners, superannuation contributions taxed at lower rates than other income sources. Personal after-tax contributions and those received under the government’s co-contribution scheme not taxed. There are limits imposed on contribution to super and penalties for going above limits. One can boost their super by sacrificing salary for additional contributions. One can arrange with the employer for part of the wages to be paid to your super fund thus helping you save tax and even boost your super too. 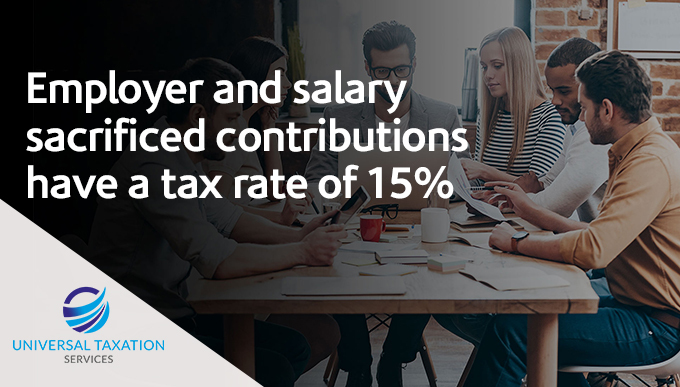 By ‘sacrificing’ before-tax salary for your super fund, the taxes stand at 15% on additional contributions. Usually, if you are paying tax for a higher bracket, then you are bound to save tax. High marginal tax rates equate greater savings. Enter into a formal agreement with your employer while drafting terms of employment ensuring that they calculate 9.5% as part of maximum employer super contribution on original salary. A limit is imposed on the amount being stored in super via salary sacrifice. Most people can line up around $30,000, along with employer’s 9.5% super guarantee contribution. This capping is known as concessional contributions cap. Those closer to retirement enjoy higher concessional caps as people aged 50 can even contribute $35,000 along with employer’s 9.5% super guarantee contribution. These are known as ‘non-concessional contributions’ since there are no tax deductions for these contributions and termed as the easiest way to top up the super fund working as a single deposit to your fund. One can use spare cash to give your retirement savings a real boost in a low-tax environment, with a better return on investment than any outside avenue. Additionally, contributions from after-tax income not taxed when the fund receives them since taxes already paid on them. One can pay up about $180,000 in non-concessional contributions on an annual basis. If you are one of those who earn less than $49,488 per year and then makes after-tax super contributions, you can get maximum through government contributions tax called government co-contribution. If income is lesser than $34,488, the co-contribution is $500 based on the $0.50 that is reserved for the government for every $1 from your contribution. The co-contribution reduces once the earnings increase and disappear after one crosses the earning threshold of $49,488 and above. One just needs to lodge a tax return for the year for being eligible for maximum government co-contributions. The ATO works out the entitlement and pays directly to your fund based on eligibility. If you earn less than or equal to $37,000 annually, the government may contribute more to your super fund that is up to $500. The amount will be equal to 15% of before-tax contributions made by yourself and your employer to your super account for the particular financial year. The ATO will then work out the eligibility and will pay directly into your super account. The payment is made irrespective of the tax filing too, although the process is slower to execute later. Income earned based on your super fund is taxed at 15% rate. This superannuation tax combined with investment management fees deducted before any of the investment earnings calculated for your account. Capital gains on assets for more than a year within the fund have to bear 10% tax. If you’re looking for advice regards your superannuation, do contact Universal Taxation since they are veterans in the field with a slew of tax advisors working under the canopy. Posted in Superannuation Contributions, tax tips and tagged contribution, funds, salary, saving, superannuation, tax, tips.